Shorewood High School went into LOCKDOWN early Thursday morning in response to a potential threat to the school received online. A lockdown is when all exterior and classroom doors and windows are locked and students remain in their classrooms. No one is permitted to enter or leave the school during a lockdown. Shoreline Police were called to investigate. 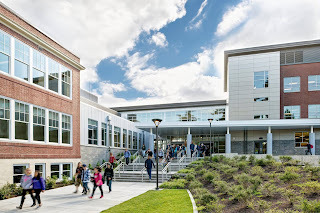 The lockdown was lifted at 10:45am and school was dismissed in a supervised manner for the day to allow Shoreline Police and school officials to continue their investigation. Students who ride the bus were provided transportation home. Students who drive to school were allowed to leave in their cars. Students who walk were checked out at the front door by a parent/guardian or emergency contact. Due the disruption to the school day, Shorewood's Curriculum Night was postponed and will be rescheduled for a future date. Police investigated a vague threat that was made Wednesday night and a specific threat that was made toward the school Thursday morning through Snapchat, an online social media app. They identified a suspect and determined that there was no credible threat to the school at this time. School will continue as scheduled on Friday. However, out of an abundance of caution, there will be an additional police presence throughout the day and limited entry and exit points on campus. Principal Bill Dunbar added, "I want to extend my thanks to our law enforcement partners for their support and diligence in ensuring the safety of our students, staff and families. "I also want to thank our students, staff and families for how they calmly and professionally reacted to the lockdown situation and following safety protocols. "Situations like today’s can be scary and stressful, but I couldn’t be prouder with how everyone worked together to calm nerves and support each other."